3rd October was the date of commemoration of the shipwreck in which 368 Eritrean exiles died, including women, children and a new born baby still attached to the umbilical cord. The day should be a day of struggle not only of remembering, to stop the deaths and for better hospitality for those who arrive. The 11th October there was another shipwreck that is not being remembered, where 265 people died including many children, from Syria and sub-Saharian Africa. This is what I wrote shortly after the shipwrecks 3rd and 11th September. I have not edited it on purpose, as the circumstances of the two shipwrecks are still unclear, but nobody talks about these circumstances any more. 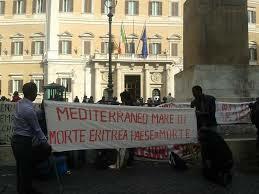 3rd October 2013: biggests single tragedy in the Meditarranean ever, at least 368 deaths, amongst whom several women and children, nearly all from Eritrea, some from Somaila and Chad. Reportedly, there was a delay of approx 1 hour between the first call and the arrival of the rescuers. Vito Fiorini, a boat owner who was sleeping in the harbour, was the first to hear the cries of the refugees. ” We tried with all our forces to pull out how many people as possible – he tells reporters – instead those on patrol of the harbour thought to take pictures and videos. It was difficult to get them on board because they slipped from our hands . ” He repeats what has already been denounced by Marcello Nizza, a tourist: “We carried the refugees four at a time , then when my boat was too full and in danger of sinking , we asked the port authorities to get them to tranship and continue with the rescue. Instead they said they could not because they had to wait for the protocol . Incredible. A boat owner says : ” They did not want me to go into the port with the survivors”. Fiorini also points the finger on the delays in rescue : “It was about 6:30 am, maybe 6:40 when I gave the order to call the Coast Guard, but they arrived at 7.30. The port authorities said they received the first call at 7am, and the rescuers arrived before 7.20. There were two boats of the Guardia di Finanza moored in the harbour. Why were not they asked to intervene? 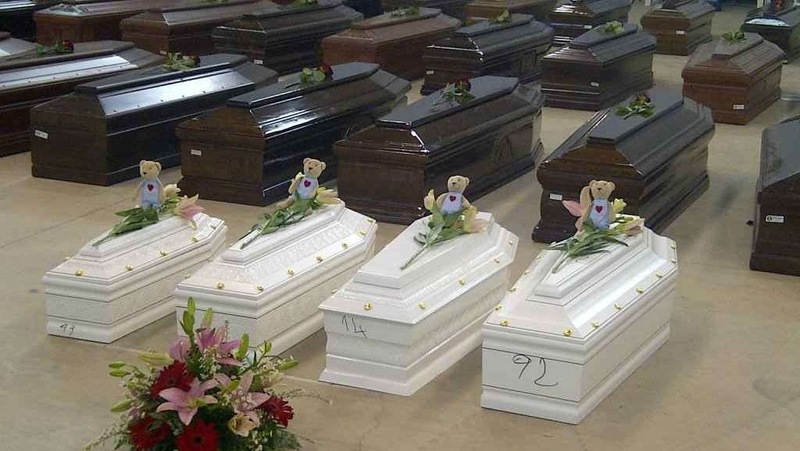 The victims were given State funerals. The survivors were charged with the crime of ‘illegal immigration’, as required by the Bossi-Fini law, and treated worst than animals, as Khalid’s video shows. 11th October: Another shipwreck caused the death of at least 277 people, 60 to 100 children. It is bewildering such a tragedy could occur, at such short distance in time from the previous tragedy.There was a delay of over 6 hours between the first call from the boat in distress, and the arrival of the rescuers: Italy told the people on the boat to call Malta – in fact the boat was much nearet to Italy, Malta being at about twice the distance. Italy and Malta kept passing each other responsibilities, instead of intervening. A large warship of the Italian Navy, the Libra, was only half hour sail away from the ship in distress. At 11.00 one of the passnegers, Mohanad Jammo called the Italian number. “I got in touch with the Italian telephone number before 11 o’clock in the morning. A women answered, first speaking Italian then English: “Give me your exact position”, she said. So I gave her our position. I said: “Please, we are on a boat in the middle of the sea, we’re all Syrians, many of us are doctors, we are in a dangerous situation, the boat is going to fall down because water is coming in. We’re going towards death, there are more than one-hundred children with us. Please, please, help us, please” (see video interview). Unknown to the Syrians, who were on the deck and upper parts, the boat was packed inside with sub-Saharian Africans. The first cause of the shipwreck was that armed men opened fire on the boat, from a Lybain vessel flying Berber flag, shortly after its departure from the Lybian port of Zuwarah, wounding 3 or 4 people and making some holes in the ship, that started taking in water. T, a Tunisian who was navigating the boat, called by satellite phone K in Zuwarah, and received the order to proceed (the traffickers who organized the trip are said to be two brothers, named Kahild and Mohammed). When rescue ships finally arrived from Italy and Malta, 6 hours after the first call, the ship had capsized. A mix of living and dead people were in the water. It is hard to figure what must have happened on board of the ship: first the hope to be saved, then the wait, for longer and longer, the anxiety, then the panifc; and what parents must have felt, watching their children drowning, having to choose which one of their children to save. A baby who had just been born on board of the ship did not live but a few hours, he was swept away together with his young mother. The delay in rescue also meant less daylight, making it more difficult to find people after dark fell: people who were hanging on pieces of wreckage must have been lost at sea, as many were seen, but not found amongst the survivors. Mohanad Jammo lost two children, aged 9 months and 6 years. ‘When Dr. Jammo asked K., the trafficker from Zuwarah, how many people were onboard he answered: “you are about 260 adults, and about 100 children.” Dr Jammo however believes that there were more than 350 adults and 150 children onboard (see video interview). While the exact number of passengers is not known, several other survivors have claimed that there were more than 400 people on board, which may be considered as the baseline’ (Watch the Med). 12th October: a third shipwreck in the Sicily Channel caused the death of 34 people, 146 were rescued by Malta. According to the survivors, they were fired upon by Libyans, who killed two people. The boat had left from the Libyan port of Zuwarah. Survivors say they had paid $ 3000 for the trip. Khalid, a Syrian refugee, took a video on his mobile phone of the inhuman treatment of people detained in the centre of Lampedusa, and passed it on to reporters. In the video, that was broadcasted on the news, you can see men and women stripped naked, mix together, and washed with hoses. One of the employees in the centre is heard saying: ‘Move on, animals!’ The video caused outrage. Khalid was almost apologetic, saying he does not want anybody to lose their jobs, but the truth needs to be told. Now all those held responsible have been susupended, and an investigation is underway. Another man called Khalid, member of Italian Parliament Kahlid Chaouki, of Moroccan origin, locked himself in the centre, demanding that all people there held are freed. The Italian authorities finally transferred the refugees elsewhere. All except Khalid, and 16 of the survivors of the shipwreck of the 3rd October. The 16 Eritrenas, and Khalid, were supposedly held there to prevent them from going abroad and disappearing, as they had accepted to testify against the men navigating the boats. There is no law in Italy which states witnesses should be held captive – for two months, in this case. The centre of Contrada Imbriacola on Lampedusa island has been closed for months now, nobody has been taken to Lampedusa since the operation Mare Nostrum started, one year ago, and migrants resuced are being taken to other places. Before it was designated an accommodation centre, that is not a CIE, Centre for Identification and Expulsion but a Centre for rescue and first accueil, and people should not be kept in there for longer than 48 hours. Exceptions however were all too common, and people have been detanied there for months on end. Thus the centre often has been functioning as an informal – and illegal – internment camp. Detention without judicial oversight is totally illegal, says Fulvio Vassallo Paleologo, lecturer in Law at the University of Palermo. 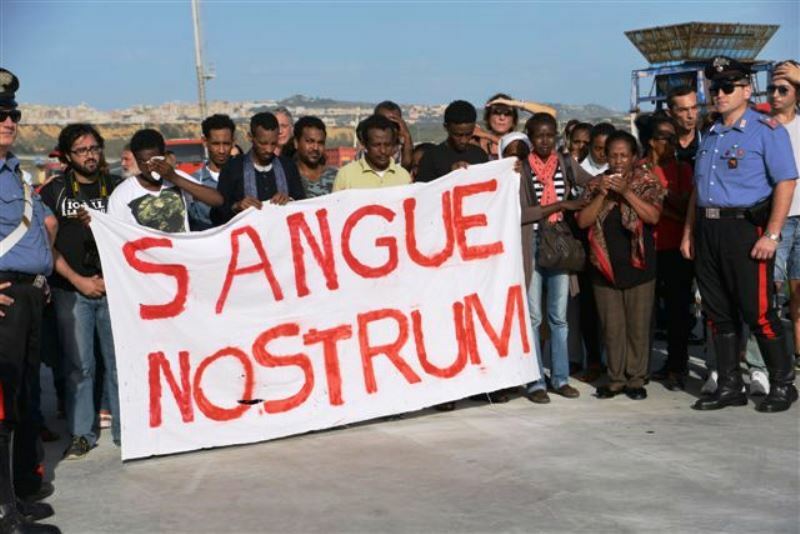 With plans to end the operation Mare Nostrum and replace it with Frontex there are also plans to reopen the centre in Lampedusa. Questo articolo è stato pubblicato in Senza categoria il 5 gennaio 2014 da EXODUS - watchtheborders.